Kermit, Miss Piggy, Gonzo and their pals are starring in their own Web site - the first in a series of new creative efforts launched by The Walt Disney Co. since they bought the Muppets in April. "Today is the first day of the Muppets being back," said Chris Curtin, general manager and vice president of Muppet Holding Co., the group formed by Disney to manage the characters. The site, which debuted Wednesday, features games, bios of the Muppet characters, screensavers and news about current projects, including the new film "The Muppets Wonderful Wizard of Oz," slated to air on ABC next May. The movie is the first since "It's a Very Merry Muppet Christmas Movie," which aired on NBC in 2002. 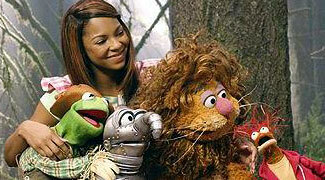 It features singer Ashanti as Dorothy, Queen Latifah as Aunti Em and Quentin Tarantino in a cameo role as himself. The film had been proposed some time back to ABC executives, but was not approved until Disney bought the characters. "We wanted to tap into the best resources we have within Disney to bring to bear on the Muppets," Curtin said. "The Muppets.com site is the first example of that." The characters have been grouped together under The Muppets Holding Co., which is teaming with Disney's film studio, television network, Internet operations and other divisions to create new films, videos and TV shows in the future. The sale to Disney, announced last February, also includes a four-year consulting arrangement with The Jim Henson Co. to provide strategic advice on the use of the characters and a three-year production deal to develop movies, television shows and other projects using the characters. The deal does not include the Sesame Street characters, such as Big Bird and Oscar the Grouch, who were sold earlier by EM.TV to the Sesame Workshop.